The mechanical and chemical digestion of carbohydrates begins in the mouth. Chewing, also known as mastication, crumbles the carbohydrate foods into smaller and smaller pieces. The salivary glands in the oral cavity secrete saliva that coats the food particles. 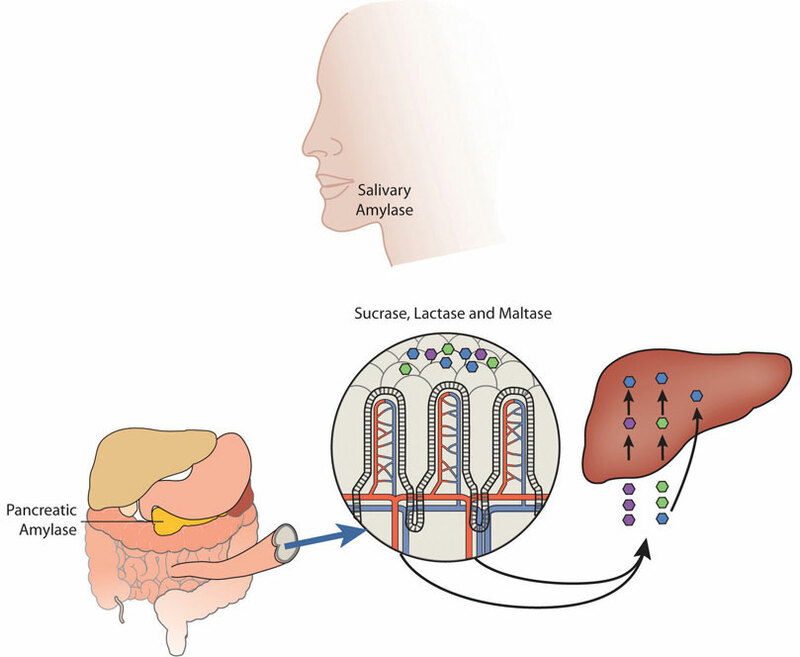 Saliva contains the enzyme, salivary amylase. This enzyme breaks the bonds between the monomeric sugar units of disaccharides, oligosaccharides, and starches. 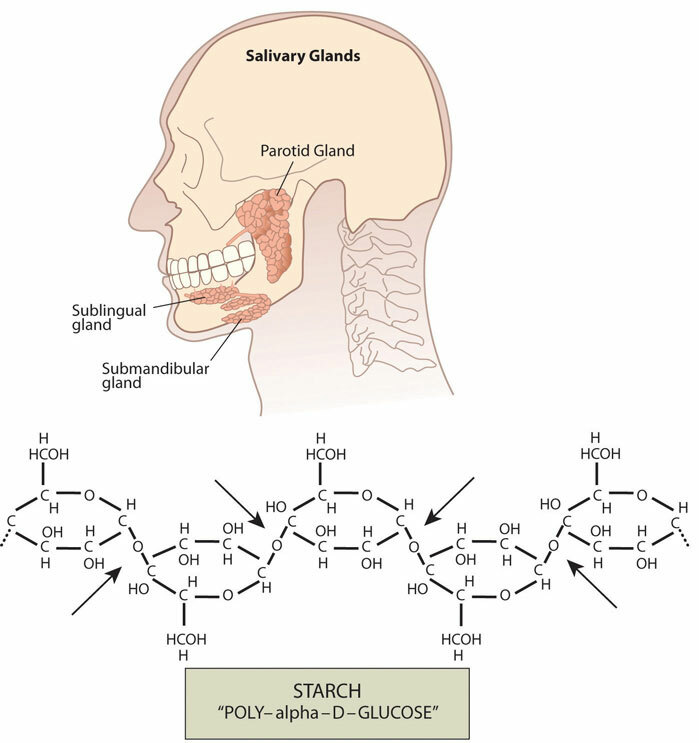 The salivary amylase breaks down amylose and amylopectin into smaller chains of glucose, called dextrins and maltose. The increased concentration of maltose in the mouth that results from the mechanical and chemical breakdown of starches in whole grains is what enhances their sweetness. Only about five percent of starches are broken down in the mouth. (This is a good thing as more glucose in the mouth would lead to more tooth decay.) 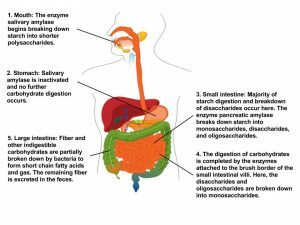 When carbohydrates reach the stomach no further chemical breakdown occurs because the amylase enzyme does not function in the acidic conditions of the stomach. But mechanical breakdown is ongoing—the strong peristaltic contractions of the stomach mix the carbohydrates into the more uniform mixture of chyme. The chyme is gradually expelled into the upper part of the small intestine. Upon entry of the chyme into the small intestine, the pancreas releases pancreatic juice through a duct. This pancreatic juice contains the enzyme, pancreatic amylase, which starts again the breakdown of dextrins into shorter and shorter carbohydrate chains. Additionally, enzymes are secreted by the intestinal cells that line the villi. These enzymes, known collectively as disaccharidase, are sucrase, maltase, and lactase. Sucrase breaks sucrose into glucose and fructose molecules. Maltase breaks the bond between the two glucose units of maltose, and lactase breaks the bond between galactose and glucose. Once carbohydrates are chemically broken down into single sugar units they are then transported into the inside of intestinal cells. When people do not have enough of the enzyme lactase, lactose is not sufficiently broken down resulting in a condition called lactose intolerance. The undigested lactose moves to the large intestine where bacteria are able to digest it. The bacterial digestion of lactose produces gases leading to symptoms of diarrhea, bloating, and abdominal cramps. Lactose intolerance usually occurs in adults and is associated with race. The National Digestive Diseases Information Clearing House states that African Americans, Hispanic Americans, American Indians, and Asian Americans have much higher incidences of lactose intolerance while those of northern European descent have the least. Most people with lactose intolerance can tolerate some amount of dairy products in their diet. The severity of the symptoms depends on how much lactose is consumed and the degree of lactase deficiency. Insulin-secreting cells in the pancreas sense the increase in blood glucose and release the hormone, insulin, into the blood. Insulin sends a signal to the body’s cells to remove glucose from the blood by transporting it into different organ cells around the body and using it to make energy. In the case of muscle tissue and the liver, insulin sends the biological message to store glucose away as glycogen. The presence of insulin in the blood signifies to the body that glucose is available for fuel. As glucose is transported into the cells around the body, the blood glucose levels decrease. Insulin has an opposing hormone called glucagon. 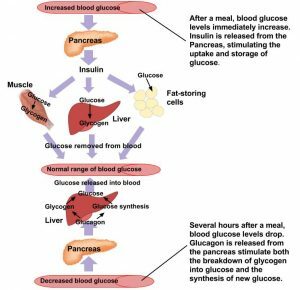 Glucagon-secreting cells in the pancreas sense the drop in glucose and, in response, release glucagon into the blood. Glucagon communicates to the cells in the body to stop using all the glucose. More specifically, it signals the liver to break down glycogen and release the stored glucose into the blood, so that glucose levels stay within the target range and all cells get the needed fuel to function properly. You are at a your grandma’s house for family dinner and you just consumed kalua pig, white rice, sweet potatoes, mac salad, chicken long rice and a hot sweet bread roll dripping with butter. Less than an hour later you top it off with a slice of haupia pie and then lie down on the couch to watch TV. The “hormone of plenty,” insulin, answers the nutrient call. Insulin sends out the physiological message that glucose is abundant in the blood, so that cells can absorb it and either use it or store it. The result of this hormone message is maximization of glycogen stores and all the excess glucose, protein, and lipids are stored as fat. A typical American Thanksgiving meal contains many foods that are dense in carbohydrates, with the majority of those being simple sugars and starches. These types of carbohydrate foods are rapidly digested and absorbed. Blood glucose levels rise quickly causing a spike in insulin levels. Contrastingly, foods containing high amounts of fiber are like time-release capsules of sugar. A measurement of the effects of a carbohydrate-containing food on blood-glucose levels is called the glycemic response. The glycemic responses of various foods have been measured and then ranked in comparison to a reference food, usually a slice of white bread or just straight glucose, to create a numeric value called the glycemic index (GI). Foods that have a low GI do not raise blood-glucose levels neither as much nor as fast as foods that have a higher GI. A diet of low-GI foods has been shown in epidemiological and clinical trial studies to increase weight loss and reduce the risk of obesity, Type 2 diabetes, and cardiovascular disease. For the Glycemic Index on different foods, visit http://www.mendosa.com/gilists.htm. The GI can be used as a guide for choosing healthier carbohydrate choices but has some limitations. The first is GI does not take into account the amount of carbohydrates in a portion of food, only the type of carbohydrate. Another is that combining low- and high-GI foods changes the GI for the meal. Also, some nutrient-dense foods have higher GIs than less nutritious food. (For instance, oatmeal has a higher GI than chocolate because the fat content of chocolate is higher.) Lastly, meats and fats do not have a GI since they do not contain carbohydrates. Visit this online database to discover the glycemic indices of foods. Foods are listed by category and also by low, medium, or high glycemic index. 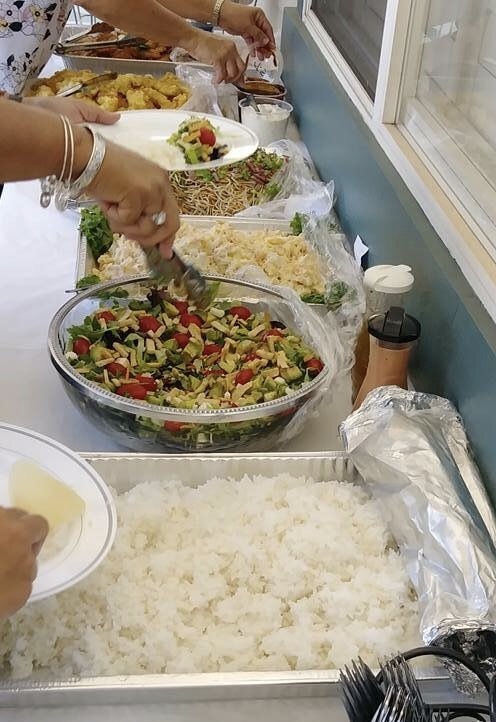 Digestion and Absorption of Carbohydrates by University of Hawai’i at Mānoa Food Science and Human Nutrition Program is licensed under a Creative Commons Attribution-NonCommercial-ShareAlike 4.0 International License, except where otherwise noted.